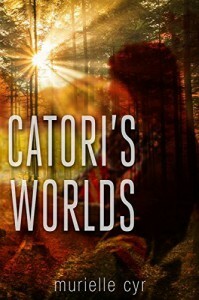 Catori's Worlds by Murielle Cyr is a delightful mystical adventure for teenagers of all ages. It is a charming non-violent story that opens up the important concern for our environment seen through the strange eyes of Catori, one brown the other green. There are elements of First People Shamanism throughout which this reader particularly enjoyed. Catori always assumed her eyes were a defect and is often teased about it in school, but when she starts seeing weird beings appearing in a grey fog she starts to wonder if she has abnormal abilities. She soon realizes her eyes show her what no one else can see and decides to confront the strange beings. But events force Catori to hop on a bus which takes her to an alternate world co-existing with ours. There she learns of teenage agents searching for others with similar abilities. These agents are the beings she has been witnessing and they inform her of the wonders and dangers she will have to deal with. The dangers are quite frightening and will keep any teenager looking under the bed before going to sleep. This new world is imaginatively described full of colour and life, especially plant life and its importance to the world. A wonderful book that has a powerful message and hopefully will be used to save our own planet. FIVE STARS for this YA Fantasy that is recommended for the whole family.